Last night, our family and my friend Myeskia Coger went to the Shalom Center's 40th anniversary Freedom Seder, held at Shiloh Baptist Church in Washington, D.C. The original Freedom Seder was held in Washington, DC one year after the assassination of Martin Luther King. It brought together African-Americans, Jews and others in the community working for civil rights, making connections between the liberation of the Israelites from Pharaoh and modern day struggles for liberation. I was really excited to go to the fortieth anniversary of that historic night. Myeskia often talks about wanting to worship with a congregation that looks like heaven will look like. I love that image--and I was looking forward to a night when Christians, Jews and Muslims of all different races, ethnicities and heritages could celebrate God's liberating power together. That's sort of what happened. There certainly was a good mix of people in the room and there were a number of speakers including a couple of young people involved with Operation Understanding DC. Our favorite speaker was Michael Twitty, a young black Jewish guy wearing a kippa with an Obama logo. He talked about learning moral lessons from the earth as he explored the foodways of American slaves and played the role of a slave in a historical re-enactment. But most of the speakers were white, Jewish and over 50. At first this seemed fine since the night began with memories of the Freedom Seder 40 years prior. The older folks held those memories and I was glad to hear them. But if the purpose of the event was not just to commemorate the first Freedom Seder but also to renew it and to impact the world in 2009, it needed stronger and clearer connection to current leaders in the African-American and Jewish communities, their passions, concerns and stories. The scarcity of younger leaders led, I think, the the other problem with the Seder. As the night wore on, something began to wear thin as speaker after speaker talked about oppression and environmental degradation and called these things "modern day Pharaohs". The speeches were passionate expressions of a position on an issue but they somehow failed to connect with me or connect me to the people around me at the Seder. I guess the idea was that we'd feel closer to each other having identified our common enemies, but to be honest, I've lost interest in community like that. Both Dan and I grew up in very liberal, political families. I grew up in a church that took stands on social issues that were in line with my family's own--liberal politics and Christianity were, in my experience, indistinguishable. We felt it was important to take a stand, to hold your ground, to be visible and vocal about your views. But there was no attempt to understand the other side and no value place on finding common ground with the opposition. As a result, people who disagreed with the dominant political view of the church didn't stick around. The preaching, most Sundays, was "to the choir" of people who already agreed with the position that was being argued for. At times, I worry if I've gone soft, lost my political edge. But in my heart, I feel like the time for that kind of politics has come and gone. I basically never preach on political issues--I try instead to look for the deeper spiritual and personal questions that lie behind the issues of our day. Why preach against the greed of AUG executives when we can examine our own greed? Why talk about Bush's Iraq policy when we can instead look at our own fear of those who are different and our own propensity towards violence? I know that we need to work for systemic change, but will we really get there if we always see the source of the problem as being "out there"? When the time came in the evening for us to discuss at our tables (in five minutes or less) the Pharaoh who we were fighting against, an African-American man at our table said quietly, "I'm fighting the Pharaoh inside me--the one who says I have to do it all, that everything is up to me, that everything depends on me." He made his comment with such humility and honesty that I felt like everyone around the table kind of perked up. That felt like a comment that had traction--something that could have led to a more thoughtful, personal and life-changing discussion about the ways in which we are enslaved and what has the power to free us. There was a lot going on at church last weekend, so perhaps it's understandable that along with most of the country we forgot to note or observe or grieve the anniversary of the current war in Iraq. It's been six years now since George W. Bush declared war on Iraq on March 20, 2003, and since that time. As of now, 4,250 American soldiers have been killed in the conflict, almost 40,000 others wounded and over 1 million Iraqis have died. But these days its easy to forget that the war is still happening. It rarely makes front-page news. But this week, it's been on my mind. We're hard at work preparing for the birthday of my ten-year-old daughter next week. I realized some time last week that the war has been going on for as long as Rosa can remember. She has no memory, no experience of living in a country that isn't at war. And as sad as that is for me, it makes me even sadder to think of the Iraqi children her age who have grown up surrounded by war and fear and despair and chaos. Six years might be a short time in the span of world history, but in the span of a child's life it is forever. This war has got to end. Although we have now elected a president who has vowed to pull out of Iraq (and to re-deploy troops to Afghanistan, a promise he clearly intends to make good on soon) I am sure that nothing will happen unless there is public pressure from U.S. citizens. And that won't happen if we stop paying attention, stop talking and stop praying for peace and reconciliation. But how to do that? How do we stay engaged in a story that is now seven years old? There are people who are lending their creative geniuses to this question, and two have caught my attention this week. Participatory Art: The Washington Post had a small story this morning about a couple of men, an American reservist who has served in Iraq and an Iraqi who is now living in the U.S., who have decided to go on tour around the country with a bombed-out car and an RV. Their hope is to provoke the curiosity of passerby, and to engage people in a conversation about the war in Iraq--the website for the project says it is an experiment "to see how willing people will be to discuss Iraq in a public space". The reporter seemed sceptical about their approach, but I was intrigued. I'm in favor of any art that invites participation and response, especially on this topic. Community Conversations: A friend of a friend of ours works for an organization called The Alliance for Peacebuilding. Dan was talking to her last weekend, and she pointed him to a document her organization has created called "A Woman's Guide to Talking About War and Peace". I thought this was going to be talking points for activists, but they've put together something much more compelling--a guide for having open community conversations about the role of the military in a democratic society. These conversations are meant to be co-facilitated by a civilian and a person in the military. The focus is not on policy in Iraq in particular, but it engages with some of the "big picture" questions which lie behind questions of when to engage our military and (very importantly) when we should not engage or disengage. At our Spiritual Education night on Wednesday this week, we were talking about the power of small group conversations among diverse people who have come together for discussion, not debate. Our speaker told of her experience with a small group which gathered to talk about global warming and our response, and we in turn talked about our church's experience with small groups which gather in response to and in support of a call, a nudge from God to engage in ministry. As powerful as a call can be, and as compelling as an issue can be, our church has long affirmed that it is the small group that gives our response staying power, direction and focus. Perhaps it is time to use that process to engage with questions of war and peace. As human beings, it seems we have a bit of this "evidence based belief" need built in to us. Of course, there are a lot...at least some things we don't need to be convinced of (the necessary qualities of water or food, etc), but there are also lots of things many of us must "see to believe". And it seems that all through history there is a need to "prove" that God exists or that God is somehow involved (or not involved) with some activity in the world, or even that Jesus was actually his son. The collection of writings that is the book of Hebrews was primarily written to...well...Hebrews...people who were Jewish and had become followers of Jesus. We see all throughout this book and in this particular passage that the writer is establishing creditability with his Jewish readers. It was important to the descendants of Israel that there was a connection with the order of the Priest Melchizedek. It gives Jesus a bit of explanatory support to show that he was not a Maverick that came out of no where, but instead is the culmination of a line of Hebrew priests. I first heard about One Book programs in the fall of 2001 when the city of Chicago held a campaign to get everyone to read and discuss Harper Lee's To Kill a Mockingbird. And I mean everyone--the program wasn't just a series of book discussions in local libraries and school. The City Council read the book. Neighborhood associations read the book. Churches and unions and private companies got in the act. The point of the program was simple--it was designed to give people something to talk about with their neighbors, something to build civic community. But there was a subtext to the program too. Chicago is a city that has a fair share of racial turmoil over the years. Talking about To Kill a Mockingbird gave the city a way to talk about race that was honest but not so scary. When I first came to Columbia, I asked someone who worked for the public library if there had ever been a "one book" program in the community. She told me with delight that there was one underway. You guessed it--"Choose Civility". That wasn't exactly what I had in mind, but clearly nothing else was going to happen any time soon. I thought of the One Book program again a few weeks ago when our new Attorney General, Eric Holder, made some very sharp but very true comments about how little experience most Americans have with talking about race. His complained that despite the advances our country has made with legal remedies to racism, we had done very little to address the rampant "social segregation" that still defines most American communities. Columbia is a notable exception, but we don't talk much about race here either. Inspired by Holder's comments I started to look around the web for some information about One Book campaigns. To my delight, I discovered that there is one underway in our state. The book that has been selected for the campaign is McBride's newest: Song Yet Sung. I read it immediately and it is a great selection. Set on Maryland's Eastern Shore, it tells an excited tale of escaped slaves, slave catchers, slave stealers, slave owners and free blacks all living together in a complex community in the 1850's. One of the characters, a Harriett-Tubman-esque woman called "The Dreamer" has some provocative visions of today's culture. Needless to say there's a lot to talk about. I intend to pursue this and I'm looking for partners. I think the book could spur some conversations that could spread through our community and make us just a bit braver about what we're willing to talk to each other about. Maybe this has never happened to you, but it has happened to us. 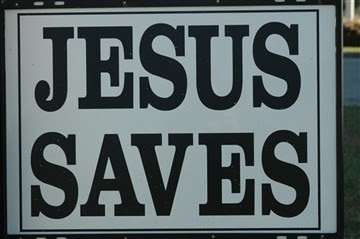 You are walking down the road and you see a sign like the one in the picture that says "Jesus Saves". Or you might see someone with the same message on a t-shirt or a bumper sticker...or you might meet someone that is excited to tell you about themselves and somewhere in the conversation s/he might use the phrase "Jesus Saves." Now if you had never been exposed to Christianity in America and you read or heard this phrase, some questions should pop up for you. Even for those of us who have been exposed to Christianity in America, since we are all good postmodern deconstructionalist children of the Enlightenment, some basic questions should be reviewed every once in a while. Who / What is being Saved? From what is 'X' being Saved? This week our lectionary readings give us several glances at this Being Saved business. In Numbers we see an interesting story that involves Moses, some angry Israelites, the wilderness, poisonous snakes, a bronze snake, and salvation. The people were following Moses who was following the direction of God out of slavery and in / through the wilderness and the people became quite upset because life seemed to be worse for them than it was before when they were slaves in Egypt. God's response to their lack of gratitude was to send poisonous snakes to bite and kill the slow and unsuspecting. The people repented to Moses. And here is the interesting part--God did not take the snakes away, he told Moses to make a snake out of bronze and put it on a pole so that when someone was bitten by a snake, they could look on this bronze snake and live...or be Saved. Being Saved is often a theme in the Psalms. In verses 17-20 of Psalm 107 we see a small story laid out that seems to run parallel to the story from Numbers. Some folks brought themselves near death because of their sinful ways, they cried to the Lord (repented) and he Saved them....healed them....delivered them from destruction. As often happens with Paul, he offers to the followers of Jesus in Ephesus a fairly didactic explanation of what it is Christ does to / for / in one's life. He explains here that this Salvation comes by Grace and through Faith and Mercy. That is one of the great things about Paul...even with something as mysterious as Grace and Salvation he does all he can to bring it back down to an understandable rational / logical explanation...which is often still a little difficult to understand because he uses some tough-to-grasp words (like Grace and Mercy and Faith) to explain a difficult-to-grasp concept like Salvation. Most of the passage from the third chapter of John this week is familiar to most of us. However, we often do not quote v. 14 where John makes reference to the bronze snake Moses made in the wilderness. Here a direct connection / parallel / allusion is made between the way the Moses lifted up the snake for folks to believe in as a conduit for their salvation and the way the Son of Man (we assume this means Jesus) must be lifted up and believed in. An interesting and important difference here is that when the folks looked at the bronze snake it meant they did not die from snakebite, but in John we see that those who Believe in the Son of Man will gain Eternal Life. Also, an important difference between the two is that the Israelites were not asked to believe in the bronze snake, just look up to it...John's audience is being asked to Believe in the Son of Man. And in the rest of the passage we are given the story of God's relationship to the world in just a few words--For God so loved the world that he gave his only son, that whoever believes in him shall not perish, but have eternal life. It seems that each of these have some commonalities. In each case, someone has transgressed against God. In each case, the transgressors find themselves in a difficult / painful situation and cry out to God for Mercy. And in each case, God chooses to bring those asking for Mercy back in to some sort of healthy state of affairs. And even with this little bit of background, it is still important for each of us (no matter our track record with Christianity or with Jesus) to take some time to make an honest account for ourselves of these questions. How can I carry your truths if I can't even crawl to you? How did we get to be the society we are today? How did we get to be the family that we are today? How did we get to be the church we are today? How did we get to be the individual that we are today? If we had it to do all over again, would we have done the same things, established the same norms, lived by the same values at the same times? Everywhere we look there are formal and informal Laws and Rules that are either formally or informally enforced...and it often seems that the informal ones are often informally enforced with a greater passion! Did you ever unwittingly cross a line - break a communal norm or a rule without really knowing that it was a norm or rule You know, those Rules that someone only learns about when they have transgressed, and only then--"No one ever asks Uncle Thomas about his glass eye."... "You should always have your yard mowed and cleaned before the Fourth of July parade"....."You cannot sit in that seat because it is where Ms. Jenkins sits every Sunday morning." (this might suggest that you aren't really part of the community yet, or it might suggest the community isn't really ready to share its norms and rules). We are subject to the rich blessings of our lived experience. Life for each of us is something of a flow chart with many, many forks in the road where we make a choice and that forever changes the route on which we travel. In our communities and in our families and in our individual lives, we learn from our experience, create some subconscious mental footnote and (sometimes, hopefully) change the way we approach similar situations for the future. In this week's lectionary readings, we are given the opportunity to look back across thousands of years of experience for people of faith, look at their experience and the resulting formal and informal rules. We also get to see them ask why there are rules, what are the rules that matter, what rules need reconsidered, what temples need cleansed, etc. Now we might tread on some wild dogma space here. You have to dance around in the world of free will, works vs faith, and God's omnipotence to even question some of the history of Christianity. We're ok with that -- we believe that questions, not necessarily answers, shape us, stretch us and make us people of faith. Sometimes sacred cows need to be turned in to burgers. In the reading from Hebrew scripture this week, Moses receives the commandments. Doing a quick tally between the two of us, depending on how you interpret and apply the Laws, we may have not kept at least 9 (maybe 10 if "murder" applies to other than humans) of the 10 commandments. These rules were delivered to a people who had already experienced God's grace and salvation. They were saved over and over again, set aside, told that they would be a great nation. They've spent a little time in the wilderness (and really, who hasn't?). They've rebelled and tested limits and boundaries and here they are, having the needs of their community addressed pretty directly. Here is delivered to them a list of seemingly simple rules. The first ones address the people's relationship with God, and the latter address the people's relationship with one another. Here are the marching orders that will order their society and ensure their harmony with Yaweh. But from reading the rest of the Hebrew story and from living our own, we know that it just isn't that simple. The Psalmist is pretty happy to place trust in God that is Good to provide a law that makes life choices simple. God's Law is perfect. Hmmm...maybe in an ideal world all of this is simple, but what happens when it is stuff between one person and another rather than one person and their God? How does God's law inform our community laws? Have you ever heard the phrase, "He is so heavenly minded he is no earthly good"? In his first letter to the church at Corinth, Paul is warning the group about their squabbles and divisions. He is redirecting some discussion about their being special "wisdom," or revelation or knowledge that empowers one as a believer. He is reminding this community that they don't need a bunch of hoops to identify themselves as Christians. They don't need visions or tongues or dreams. There aren't special rules that mark this community and these people. They need their faith, and that is about it. Paul points out that the Jews have Law and Greeks have Wisdom. Christians, by contrast, may seem foolish in their simple faith. And as he will remind them later in this letter, they are fools all right - fools for Christ. Again this week, we read about an angry and emotional Jesus in the selection from John. The Passover is drawing near and Jerusalem would have been crowded by faithful, law-abiding Jews seeking to make their offerings and sacrifices at the Temple. Jesus enters the Temple and sees the vendors who would have been selling the animals necessary for lawful sacrifice and money changers who were ready to exchange foreign currency. These vendors are all working to feed themselves and their families. Some of them are likely honest and some of them are likely dishonest and taking advantage of folks. Either way, Jesus is mad about the whole thing because people were coming to make sacrifices and buying and selling things in the courtyard of the temple because of laws that were given to / by Moses and had been interpreted and reinterpreted and adapted and messed up in a hundred different ways. He was angry because they were not there to worship God, but instead to fulfill some human-created expectations. So a set of rules were handed down for the good of a people, but over time, the rules were changed, were reinterpreted, were added to and used to create the righteous and the unclean. How many times do we start out with something good and over time we misuse, abuse and forget the real why? How do we set things right again when that happens? How do we return to original relations? How do we return to God? What are the necessary rules? I will give them one heart, and put a new spirit within them; I will remove the heart of stone from their flesh and give them a heart of flesh, so that they may follow my statutes and keep my ordinances and obey them. They shall be my people, and I will be their God. Faith is a tough idea for us to get a handle on some times. And we were always told that you should not use a word to define itself. couple of different perspectives on Faith. created a radically different dynamic between the people and God. declares that he is going to suffer and be rejected by his society. call on individual lives and souls of individual people. Do you have Faith? In what? come from this 'faith' either. done them and continues to do them without ceasing."